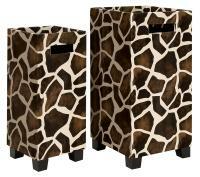 We love this Animal Print Umbrella Holder Set! What a fun accent for your entry, mud room or office! This unique set can also be used as planters to hold tall sticks or greenery. The stylish set of umbrella holders is crafted from a faux leather material designed to look like animal hide. The holders sit on wood legs. For more details visit www.cheapchicdecor.com.